Similar to Buddy the Elf, the michael alan group is a big fan of celebrating the holiday season. Throughout the years, the MAG team has found this time of year to be exciting and special for targeting consumers. There seems to be an extra bit of jingle and happiness in the air making activations and participants more interested and engaged. Looking back or “TBT”ing, the michael alan group has executed some very holiday-esque programs to spread cheer. Let’s take a look at a few of our favorites! During the holiday season, everyone attends at least one ugly sweater party if not two! We took this idea and paired it with our Flatiron 23 Days of Holiday Cheer program two years in a row. Our first year consisted of a live event complete with judges and a runway for contestants to strut their stuff and showcase their sweaters. Passersby stopped in their footsteps to clap and root for the participants. The winner was selected based on the creativity of their sweater and their answer to a random holiday question. Photos of the event and winner were featured on social media outlets for all to see. To mix it up a bit for the following year, we worked with Café El Presidente to throw an ugly sweater happy hour. This removed the competitive aspect and focused on bringing New Yorkers together for some music, food, drinks and the opportunity to spin the custom Flatiron prize wheel. Once again, everyone enjoyed themselves as they celebrated their love for ugly sweater parties. The holiday season would not be complete without the mounds of candy, chocolates and sweets we indulge in. One of our favorite sweet-filled campaigns was the ION Gingerbread House. For this event, we created a large-scale gingerbread house complete with all REAL ingredients such as graham crackers, icing, gummy bears, candy canes, etc. The whole house was edible! Well it was… until we sprayed it with preservatives. 🙂 Fun fact, each gummy bear was 5 pounds and if you dare to ask –contained over 1,600 calories. Talk about a sweet treat. The edible house was placed on a flatbed and toured around NYC targeting media agencies. Agency representatives were encouraged to climb on board and create their own tin of goodies. Participants took lots of photos outside of the gingerbread house to share with their family and friends. The ION team also stopped by to thank reps and wish them a great holiday season and Happy New Year! Smiles are big and bright during the month of December due to all the festivities, lights, goodies, giving and upbeat singalongs. 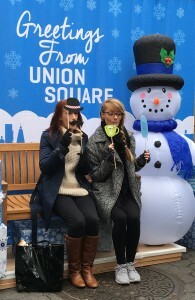 To create smiles with our friends at the Union Square Partnership, we assisted with launching a holiday greetings photo op. The photo experience was complete with a custom holiday themed background, hand-held props and of course, a complimentary print-out keepsake. Consumers of all ages happily participated in snapping their photo and sharing it on social media. To top off the event, we passed out branded Union Square cookies and fresh hot chocolate. Don’t be fooled, MAG always puts aside some time to plan their own holiday shenanigans. Each year we host a few traditions including a Secret Santa swap and donations to New York Cares through their Winter Wishes gift-giving program. And of course, the calendar year wouldn’t be complete without the annual MAG holiday party. These have been known to feature MAG Libs, specialty cocktails, karaoke, and custom videos produced in-house dubbed The Real Employees of MAG. All of these activities not only bring the team together to celebrate the holidays but they also allow us to reminisce over another successful year together. From all your friends at MAG, we wish you a joyful holiday season and a happy and healthy New Year!